Henry Vaccaro, author of "Johnny Cash is a Friend of Mine", will do a book signing on March 9th at the Silverball Museum in Asbury Park. 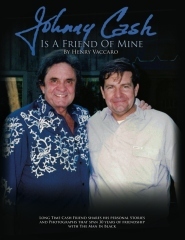 Through a combination of intimate stories, never-before-seen photographs and a personal touch unseen in previous books, New Jersey General Contractor and former Kramer Guitar Chairman, Henry Vaccaro, has penned an indispensable book in the lexicon of Johnny Cash. True to Johnny’s legacy, every word in the book is true. The success of the film “Walk the Line” was in inevitable re-introduction of one of America’s most legendary music pioneers, but it left forty years of Johnny and June Carter Cash’s life untold. Henry Vaccaro met Johnny Cash shortly after the film concludes and for the first time, fans and to-be fans have an opportunity to learn more about what made Johnny Cash… Johnny Cash. The book chronicles an intimate friendship from the early days of the Kramer Guitar Company, through Cash’s work with his adopted city of Asbury Park, until the day he died. It features a supporting cast including Hank Williams, Jr., Waylon Jennings, Ernie Anastos, June Carter Cash and many more. It follows Johnny and Henry from Asbury Park to Nashville, from the swamps of Georgia to the Bahamas.